Originally published by The Transmetropolitan Review. 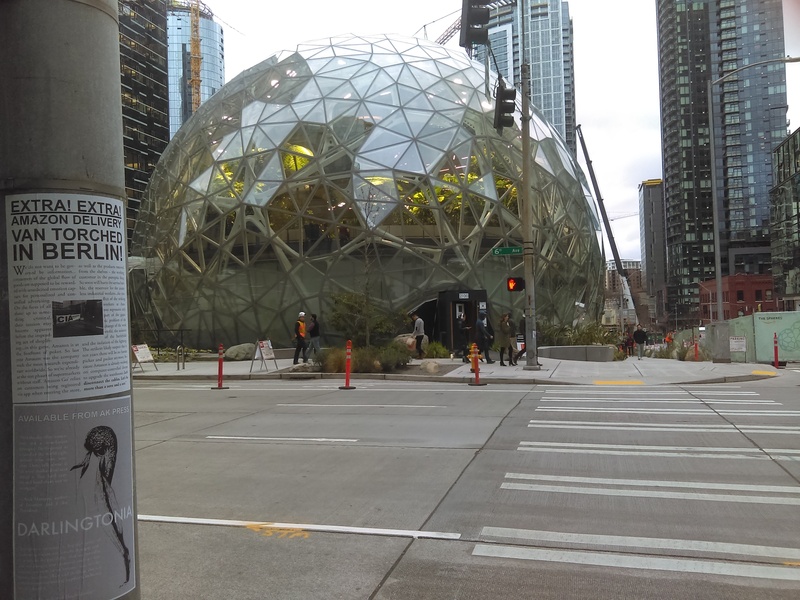 On a warm spring evening (it’s winter), the public surfaces around HQ1 were covered with hundreds of posters related to Amazon and the tech industry. The first carried the bold headline: EXTRA! EXTRA! AMAZON DELIVERY BAN TORCHED IN BERLIN! This was followed with a brief extract from a communique that accompanied the torching of an Amazon delivery van on the streets of Berlin. It also featured the image of a train blockade linking Amazon to the CIA. Since the overlords of Amazon have suppressed this information from reaching its employees, these posters were meant to remind roughly 40,000 tech workers that hatred of their company is rising. Not only were they pasted all around HQ1, they have been scattered around the city at Amazon’s multiple locations. Good luck to our friends in Atlanta in their new campaign to stop the HQ2 bid! Good luck to our friends fighting the new Google Campus in Berlin!